The word ‘security’ has been succinctly defined as “the state of being free from danger or threat”. In Eritrea’s militarised society where everyone, sometimes as young as 15 years — despite the legal age being 18 — is forcibly enlisted into military service for an undetermined period of time and compelled to live the life of a soldier in a country not at war — I began to weigh the odds of a child’s ‘security’ in such an environment. The truth is, Eritrean mothers and families are faced with a dilemma, a very difficult choice when it comes to the future of their girls. Families either allow their daughters to be conscripted where they run the risk of becoming victims of sexual harassment, assault and torture in military training camps or marry them off before they turn 18 and encourage early pregnancy because the government is more likely to overlook married or pregnant girls not fulfilling their forced military service. Here, families are compelled to contemplate the possibility of child marriage as the lesser of two evils. What a disturbing prospect. In 2013, prevalence of child marriage in Eritrea stood at 47%, placing the country at thirteenth in the world in terms of child marriage. Essentially, the high prevalence rate can be viewed mainly as an act of desperation – the choice between compulsory national service, both for women and men, and early marriage. Child marriage as a traditional practice is becoming out-dated in Eritrea. Why then is it still an issue? Global trends reveal that the most vulnerable girls are from poor uneducated communities. 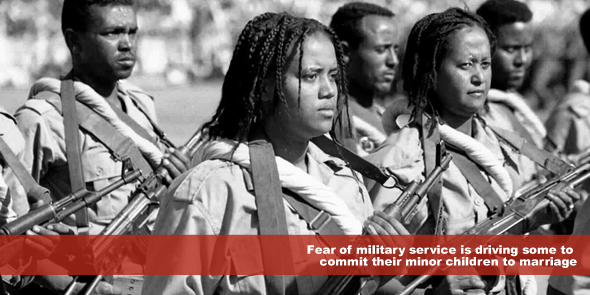 Eritrea is no exception as no one is exempt from military service. As a result families consider early marriage for their daughters as an escape route from the endless national service. However, as UNICEF research shows, girls who marry young abandon formal education, become pregnant and are confined to a domestic life – essentially, girls are denied the right to participate freely in everyday life. In 1993, Eritrea became a state party to the Convention on the Rights of the Child (CRC), the first legally binding instrument intended to protect and promote children’s rights. To further show its commitment; in 1999 the country ratified the ACRWC. Consequently, Eritrea is bound by all rights guaranteed for children, namely the right to a childhood, education and protection from sexual exploitation. The CRC has continually urged Eritrea to ensure that customary laws that still allow for child as young as 13 to be married are brought in line with standards set at in international, regional and national instruments which set 18 as the minimum age for marriage. Child marriage is malicious subordination of girls, and through it the unequal relations between men and women is maintained. The fact that fear of military service is driving some to commit their minor children to marriage is appalling. The fact that families are cornered into risking the lives of their daughters to dangers associated with child birth at an early age, or forcing them to abandon their studies is unacceptable. While sparing their daughters the spectre of endless military service, through being married off as minors children are exposed to other human rights violations that will impact on them for the rest of their lives and negatively affect the nation at large for generations to come. At first we considered the possibility of a lesser evil – my conscience sees none.